A Spock eyebrow doesn’t rate a tag? There may be one or more former Disney Channel “stars” on this cover. Three redheaded dominatrices? Just a moment while I Google that. Gentleman, didn’t you say “stay away from me” and I wished you good day Sir. Have a good day. 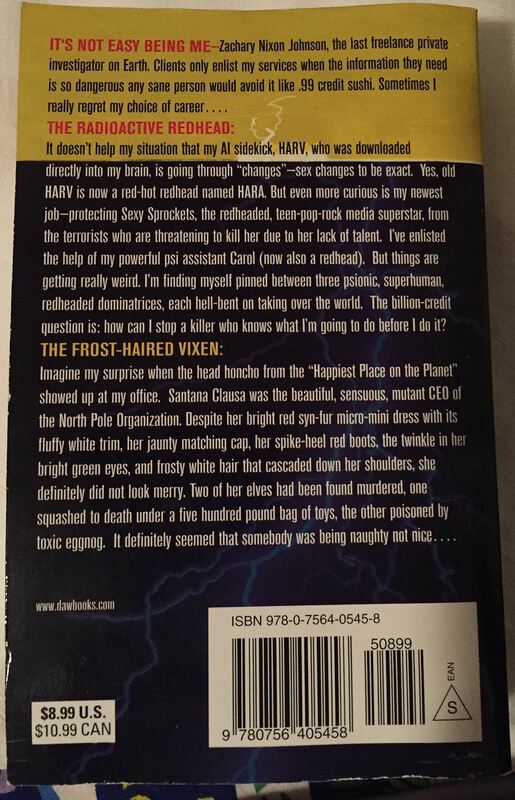 @FB – Googling “Frost-Haired Vixen” is how I learned about MELFs! Is Lithium Radioactive ? I don’t mean to be pedantic but isn’t three electrons Li ? Surely the artist could off painted all 92 electrons of uranium 235 ? @MisterBob – She’s on lithium because she’s so depressed she’s on this cover. @fred – Find me two covers with “Spock eyebrow” and I’ll start a tag. Disappointed there’s no “Inside of a Crunchie Blonde”. You may be positive but I’m uncertain that those electrons are drawn in the correct positions. The third book in this series, Atomic Blonde, has just been adapted into a major motion picture starring Charlize Theron! Is that a radioactive hat? It looks like it’s attached to her forehead. 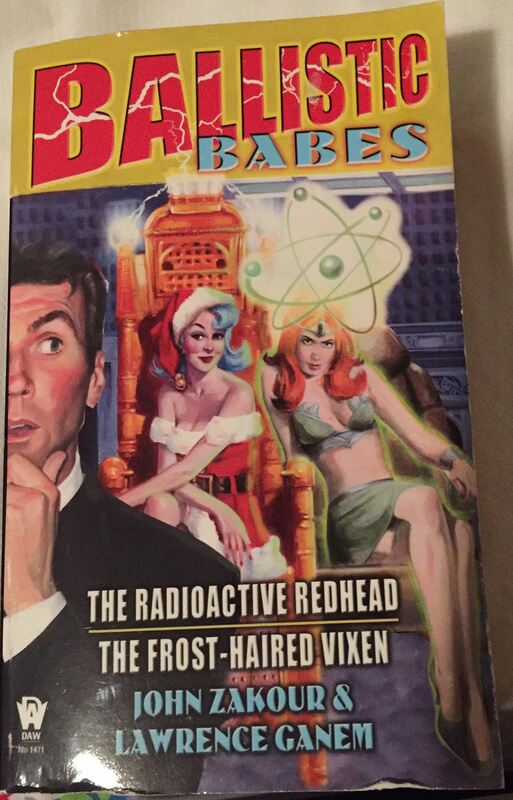 What are Anthony Scaramucci, Katy Perry, and Karen Gillan all doing on the same book cover? The blurb makes it sound like an entertaining read, at least for someone with a bad sense of humor like me. I know I shouldn’t trust it, but I just might try to find a copy. These authors aren’t half as clever as they think they are. Even back in the pulp days, they generally didn’t throw EVERY cliche into one story. Presumably the lithium is to help with the bipolar disorder… or certainly for the manic episode this cover is. If ever a piece of “art” needed lithium, this is it. Lithium is classed as a “miscellaneous antipsychotic”, which sounds like just what the doctor should order for this book. Um, the anatomy isn’t too bad, except for the girl in green missing a navel. and Virgin Planet is positively loaded with single raised eyebrows. Does this mean we get a new tag? @Tom Noir: Atomic Blonde was adapted from a comic book with a completely different title, not a book in this series. I wonder why the Radioactive Redhead is attempting to cosplay as a Batman villain, for I can see no good reason for her to do so. As for the Frost-Haired Vixen, I can only conclude that she’s attempting to dress in a seasonally appropriate fashion. @Anna T: Yes, I’m aware. Jokes! You know those college radio stations where two self-appointed “funny guys” just blather on for hours, clearly believing that their self-absorbed improv is God’s Gift To Comedy, and it’s never funny? Same thing. Ooh, the audio book covers are even worse! Apparently, our hero and thus the series are called… Zach. Zach, PI. Zach the gumshoe. Shamus Zach. Not really in the same class as Spade, Marlowe, or Magnum, eh? Was unable to find out if either writer ever did radio.